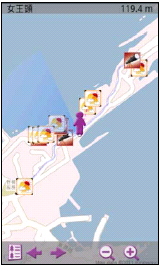 SuperGIS Mobile Tour is a mobile GIS solution designed especially for outdoor tour guide. With the features of Android and integrating with GPS, GIS and AR (Augmented Reality), SuperGIS Mobile Tour is capable of displaying pre-generated map and web map and also showing tour guide information with multimedia. The newest SuperGIS Mobile Tour 3.1, which is going to be released in the near future, mainly enhances manipulation of management tools, improves the display of photos of scenic spots, leverages customization, and provides more flexible and easier method to tourism administrators to design outdoor tour guide system meeting their requirements. 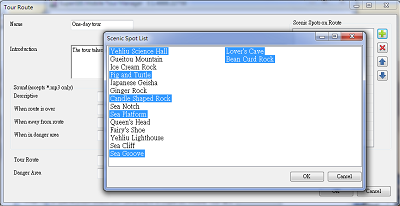 SuperGIS Mobile Tour Manager enables users to design tour map source, scenic spot icon, tour guide information of scenic spot, itinerary arrangement and so forth. Through the easy manipulation interface, information of scenic spots can be updated more easily, and the tour guide contents can also be managed effectively. SuperGIS Mobile Tour Manager provides flexible customization function which can make the system satisfy users’ actual needs. Danger area and tour route can be set in each project to prompt tourists who are using the system that whether they are heading the correct direction or deviate the route. In addition, SuperGIS Mobile Tour 3.1 supports to switch start pages of the system, making design of each tour guide more distinct. Integrating with GIS and GPS technologies, SuperGIS Mobile Tour 3.1 enables users to set pre-generated map or read web map as the basemap. 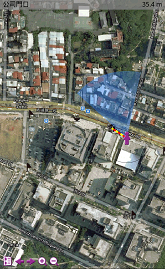 With elastic map viewing manipulation and real-time GPS positioning, tourists are able to recognize their current position and the spot they would like to go to. Besides, with the GPS tracking record of tour guide functions, information of the scenic spots which are visited most frequently and are most popular can be provided to administrators. Through AR, the system can turn on camera function of mobile device to display tour spots during excursion. Thus, tourists can recognize the direction and the shortest distance between the current position and the scenic spots nearby. And this relevant information is provided as reference of tour routes selection. 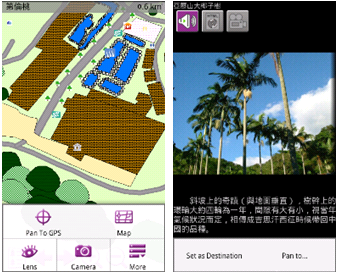 SuperGIS Mobile Tour can display scenic spot information with multimedia, such as picture, text, audio and video, etc. Tourists are able to comprehend scenic spots information with multimedia by manipulating mobile devices. Besides, the warning voice message will be played automatically when tourists approach the danger area or deviate the route. SuperGIS Mobile Tour now has been successfully applied on relevant tours like campus guide, ecotourism guide, and local culture tour guide, etc. The system is capable of assisting schools or tour management centers in updating and maintaining the information of scenic spots effectively. Moreover, with popularization of smart phones and diverse mobile devices, APPs created through SuperGIS Mobile Tour can be installed on mobile devices quickly for students and tourists to use. Therefore, integrating with the newest technologies to enrich tour guide contents, the system also reduces paper utilization for traditional tour guide.